David Deci, MD (in red) and FMIG students with the AAFP Program of Excellence award. 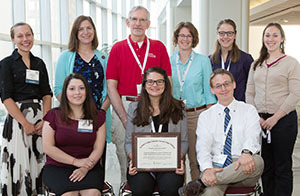 The University of Wisconsin School of Medicine and Public Health’s Family Medicine Interest Group (FMIG) earned a 2015 Program of Excellence Award from the American Academy of Family Physicians (AAFP). The FMIG is one of 19 programs to earn the honor, which recognizes medical schools for their outstanding activities in generating interest in family medicine. The FMIG is a student-run organization with both Department of Family Medicine and Community Health (DFMCH) and AAFP support. It gives medical students who have an interest in family medicine a supportive environment in which to explore and experience the specialty. For example, the FMIG sponsors an annual procedures workshop, which gives students hands-on experience in many of the procedures that are part of primary care practice. It also offers students the opportunity to shadow family residents on call at St. Mary’s and UW Hospitals. In addition, this year, the FMIG spearheaded the first Basic Life Support in Obstetrics (BLSO) curriculum for first- and second-year students at the UW School of Medicine and Public Health. All 16 instructors were DFMCH faculty and residents. FMIG also organizes monthly seminars for students in which faculty and residents present on topics such as nutrition, geriatrics, work-life balance and match tips. “Our FMIG is a powerful force for getting medical students interested in family medicine and directly links to the DFMCH’s ranking as one of the top ten departments that match students into our specialty,” noted DFMCH Office of Medical Student Education Director David Deci, MD. “This award underscores the engagement of our students, staff and faculty in making family medicine exciting and relevant,” he continued. “Attracting medical students to the specialty of family medicine is critical to answer the ongoing primary care physician shortage,” said Clif Knight, MD, vice president of education at the AAFP. “Excellent FMIGs such as these award winners are an important component in these efforts. They’re essential to helping medical students understand the professional challenge and satisfaction of being a family physician,” he continued. The awards were presented July 31 during the AAFP National Conference of Family Medicine Residents and Medical Students in Kansas City.